Purdue University Stamps Scholar Katherine Lin plans to work in medicine to give back and experience a variety of cultural perspectives on health while exploring the forefront of biomedical technology. Lin grew up in Broomfield, Colorado, and attended Peak to Peak Charter School with her twin sister. There, she was a board member of Key Club, Spanish Honor Society, and National Honor Society. As a member of both the wind symphony and jazz band, she was also involved in the Tri-M Music Honor Society. Moreover, she was a valuable member of the varsity cross-country and tennis teams. Her experience volunteering with an ALS association and helping those with the disease — particularly a man who was an engineer — helped her to delve into the relationship between technology and medicine. 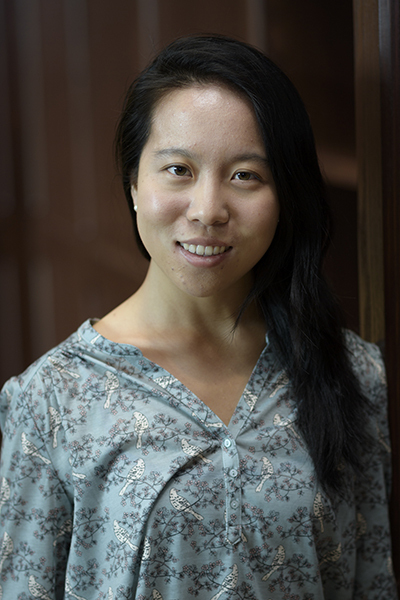 She has worked on this research for three years, looking at bioadhesives for neurorepair in the lab of Dr. Riyi Shi, professor of biomedical engineering and neurosciences, to investigate ways of repairing damaged nerves that are severed either through traumatic injury or degeneration. For Lin, it was empowering to design her own experiments and yield exciting discoveries about neurorepair. Beyond the lab and research skills this experience equipped her with, she also gained confidence in probing difficult topics in medicine such as anastomosis of severed nerves, pathological factors in neurodegenerative diseases, and nanotechnology to improve drug delivery to nervous tissue. In addition, she has been involved with Timmy Global Health, a global health organization founded by Dr. Chuck Dietzen. Her freshman year, she completed a domestic service trip to Atlanta, Georgia, where she worked with homeless shelters and nonprofit organizations that focus on medical supply and educational material collection for alleviating resource deficiencies abroad. She remembered speaking with a homeless father who lost his family and home in a devastating fire. From this story and many others, Lin felt inspired and humbled by people’s perseverance against tragedy and poor circumstances. After her sophomore year, she was a clinical research intern at the Washington University School of Medicine, studying transcatheter aortic valve replacement, a procedure that takes advantage of new technology in the cardiovascular field. Through her interactions with patients to assess their rehabilitation, life quality, and emotional status post-TAVR, Lin realized the critical role of translational research in improving lives. With her scholarship enrichment fund, she traveled to Ireland to work on biomedical device design. By partnering with Croí House in Galway, Katherine worked with her team to develop a prototype for a robotic echocardiogram probe to reduce the incidence of chronic injury and pain experienced by cardiac physiologists. She also collaborated with the teaching team to deliver a lecture on the Health Insurance Portability and Accountability Act (HIPAA) and its importance in protecting patient privacy. From this experience abroad, Katherine began to realize her love for traveling and the value in a global education. She then used more of her enrichment fund to study abroad for a semester at ETH Zurich in Switzerland, where she took classes in the health sciences and technology department. One of the most exciting moments during her time abroad was when she traveled to Argau Hospital to converse with surgeons and observe surgery. “That was really incredible for me to experience medicine in a different country, especially in a non-English speaking country.” Working on multinational teams in her challenging courses allowed her to think creatively, and she benefited from the diverse perspectives and stories she shared with her international friends. At Purdue, she served as vice president of Alpha Eta Mu Beta (AEMB) biomedical engineering (BME) Honor Society. She helped with programs within the Weldon School of Biomedical Engineering, such as community outreach events to high school students, particularly female ones, and study sessions. She was also an ambassador through the department, meeting with alumni and executives visiting the school and talking to them about industry and working in the biotech field. In addition, she served as a teaching assistant for a human physiology course, helping students get through one of the toughest classes in the major. Outside of school, she worked as a para-professional for the Greater Lafayette Area Special Services, through which she worked with an autistic student on her high school classes. She was honored to “help someone who had more trouble than I do in learning because I know education is so important.” Her drive to help others succeed in academics is also the motivation for her service as a tutor for student athletes through Purdue’s Athletic Department. In her free time, she enjoys hiking — including a recent “Fourteener,” one of Colorado’s famous mountains over 14,000 feet in elevation — as well as tennis and skiing. Lin graduated this past May and plans to build a career centered on healthcare and innovation. She is currently working at Hill-Rom, which designs and manufactures hospital beds and equipment. Her goal is to improve lives through advances in biotechnology.